The first United States 10-cent coins, or dimes, were minted in 1796. The word "dime" is from the French word "disme", meaning "decimal" The Draped Bust design was first employed on the dime, as it was the standard for all silver coins beginning that year. For a couple of years, a smallish eagle atop a cloud was depicted on the reverse. In 1798, the small eagle was replaced by a larger eagle with the Union Shield across its breast. This "Heraldic Eagle" met with more favor from the public, for it presented a much more powerful symbol of the United States. The number of stars on the reverse created several varieties of the Draped Bust dime. The plan at first was to add another star for every new state joining the Union, but by the time the 16th star was added, the field had become so crowded, that Mint Director Elias Boudinot limited the number of stars to 13, representing the number of original colonies. Production of the Draped Bust dime continued until 1807. The 1798 8 over 7 is a typical overdate found in early US coinage. An overdate is defined as an impression made by superimposing another date (i.e. year) digit over a date digit of a die used in an earlier year. The result is a coin bearing the “new” date, but under close examination, the “old” date is faintly visible. Overdates were relatively common at the first US Mint because of the scarcity of coining resources. Thus, workable dies left over from a previous year were often overdated for use the following year. No dimes were minted in 1808. The following year, the Capped Bust design was introduced. There are many overdates and other varieties to study, many of them available in plentiful quantities. In 1828, new technology was implemented at the Mint to create edge reeding during the striking action, while utilizing thicker, smaller diameter planchets. The results were improved diameter consistency and higher productivity, as the tedious job of manually applying the reeding was eliminated. Another benefit was that the coins were easier to stack. 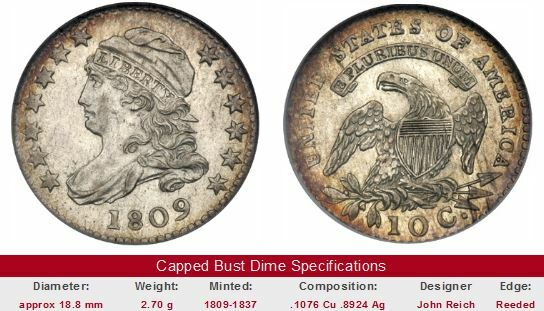 The Capped Bust dime was finally discontinued in 1837. 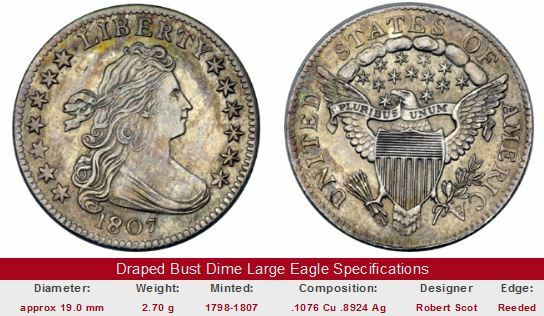 Together, with the Draped Bust dime, United States numismatists have categorized these types as the "Early Dimes." Draped Bust dimes are all relatively rare, costing at least hundreds of dollars for an example in heavily worn condition. They've all advanced fairly consistently in value over time, but the 1796 first year issue and the 1798/97 13 stars variety seem to edge out the others in performance. 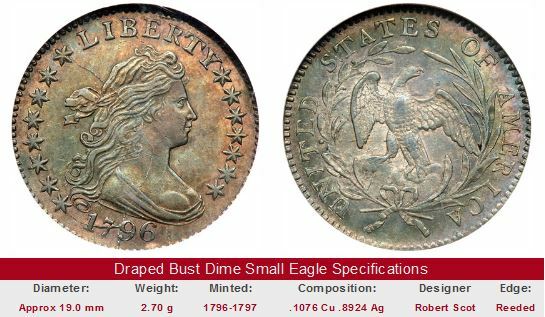 A collector really can't go wrong by acquiring these or any other Draped Bust dime, just don't expect any explosive growth headline news anytime soon. The Capped Bust series has a couple of scarcities, but our research shows these to be sluggish movers, and should be avoided if strong prices surges is your objective. There are plenty of other exciting coins from America's past with better prospects of appreciation to target. As always, don't buy Early Dimes unless they've been certified by PCGS, NGC, ANACS, or ICG, or are being sold by a reputable dealer. Key date Early Dimes are offered for sale below as eBay auction coins. The left hand side of each "Sales Box" is value trend data over a very long period of time for the dime in G-4 condition. The percent annual increase is computed for comparative purposes. The coin pictured for sale in the right hand side is not necessarily the same condition coin as that represented in the value trend analysis on left hand side.